igh Energy: combines de-boned lamb and turkey with sweet potato as a low GI carbohydrate source to give your active dog all day energy. R·O·R Lamb & Lean Turkey is made with the highest standard, prime cuts of nutritional bone-free meat and does not contain any indigestible bone. 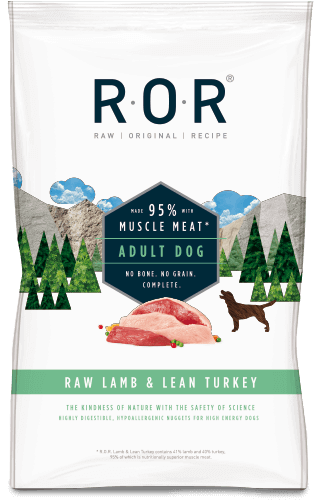 Using bone-free meat means that R·O·R contains the perfect balance for essential amino acids, energy requirements and nutritional qualities needed for adult dogs, as well as being easily digestible. Deboned Lamb 50%, Free Range Deboned Turkey 35%, Sweet Potato 5%, Carrots 5%, Redcurrants, Salmon Oil, Seaweed, Yucca, Green Tea, Dandelion, Hawthorn Leaf, Beet. Calcium 0.24%, Phosphorus 0.20%, Crude protein 10.30%, Crude Fibre 0.30%, Moisture 66%, Ash 1.80%, Total Oil 16.71%.